Since 1992 we have operated a Holstein herd of 120 head, including 60 cows in lactation, with a current herd average of 11,300 kg with a BCA of 255-265-260 and a Classification of 5 EX, 26 VG,18 GP. Our priority is to breed cows combining great conformation and good production in an environment where comfort is the priority. In recent years, we have acquired animals with high genetic potential like Bolton Season from the Splendor family, Manoman Rosie from the Outside Roz family, Bejeweled Snowman from the Barbie family, Brawler Janice, a granddaughter of Daurel, and our latest acquisition, Oman Kool from a renowned U.S. cow family, the K Kays. We produce many flushes every year with the most popular bulls. It’s very inspiring to continue to create new generations and breed heifers from our best cows. We have also diversified our herd with some red and white polled animals. In our free time we also breed Miniature horses and Persian exotic cats! 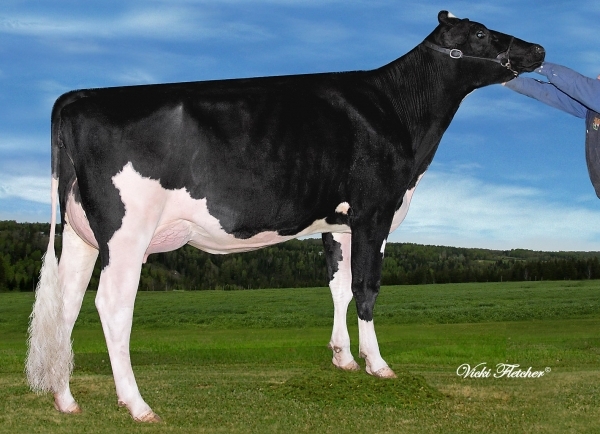 ALNA JANUARY MITSONIKA, 87 points,famille souche à la ferme ALNA LEDUC MITSOU EX. OAKFIELD FEVER SNOWY, 87 points, famille de Despointes James Sydney, EX. C-HAVEN OMAN KOOL, 88 points, achetée a la vente Intrigue 2013. CRACKHOLM ROUMARE FELECIA, EX3E, dans la famille de FEVER. ALNA BOBINETTE SHAW 83 points, petite fille de GEN-I-BEC SHOTTLE BOMBI. 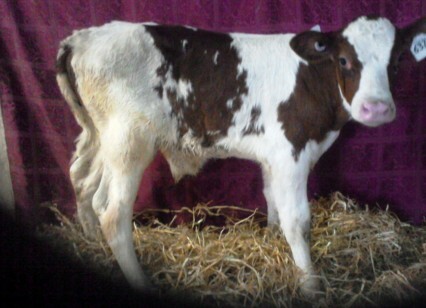 Very beautifull red bull born Mai 10th from the Splendor family. #106357425 (from the Spendor family). Nice opportunite for red lovers. 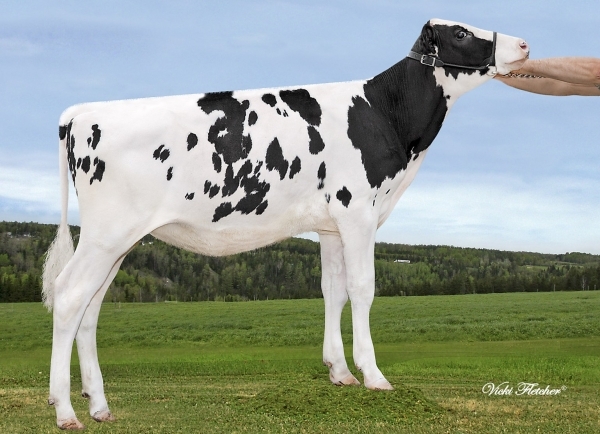 Alain Choiniere farm is proud to have one of Hailey Goldwiy EX-97 $E 5* daughters, her name is Hailstrom Aftershock EX 90 points. Thank you Mario Comptois for this opportunity. 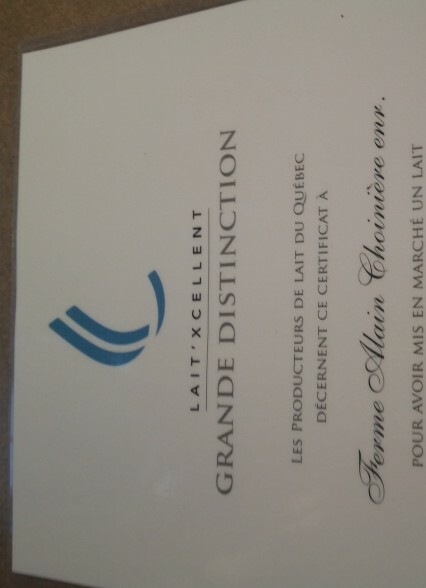 For the 5th year the Alain Choinier farm received a recognition certificat for the high quality milk that was delivered during the year 2015. A buy at the Jocelyn Cote auction ! 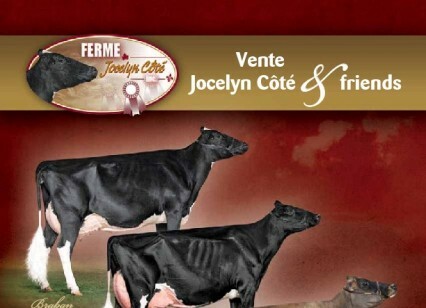 We are glad to intergrate at the farm a beautiful Fever that we bought at the Jocelyn Coté auction last friday the 22th of March.The third mother is the great Despointes James Sydney EX- 94 11* Grand Champion et the Royale in 2003, her mother (90 pts) and grand-mother (95 pts) are also classified excellent. Production management, environmental protection, strategic dev. management of human and financial resources, and social influence. The competion placed us with the 4th place with 833 points in 1000. 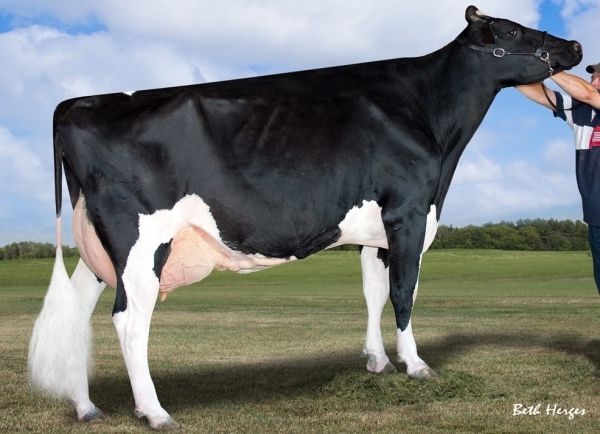 A new excellent cow at the last classification visit - 9 december, ALNAHOLSTEIN : ALNA IOTA SEDUCTRICE 90 pts, she is the daughter of the very popular GEN-I-BEQ SEASON BOLTON 88 pts from the Splendor family ! 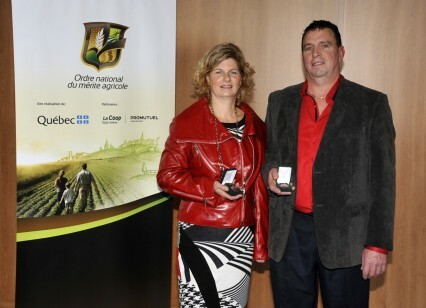 LAPRESENTATION BRAWLER JANICE small daugter of the famous DAUREL (62*) made 87 points. ALNA SNMAN SNOW WHITE white 87 points , ALNA IOTA SEDUCTRICE 86 points, ALNA SNMAN SEALVYANE 86 points. Will be flusing soon LAPRESENTATION BRAWLER JANICE , ALNA SNNAN SNOW WHITE and BLONDIN GOLDWYN LINDSAY. 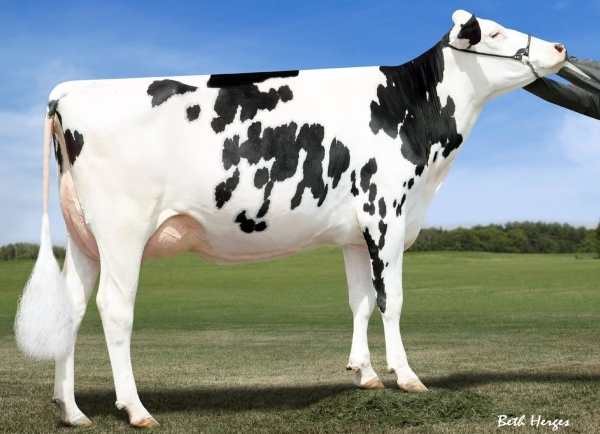 New acquisition at the Supreme Dairy Sale: Distinction daughter! 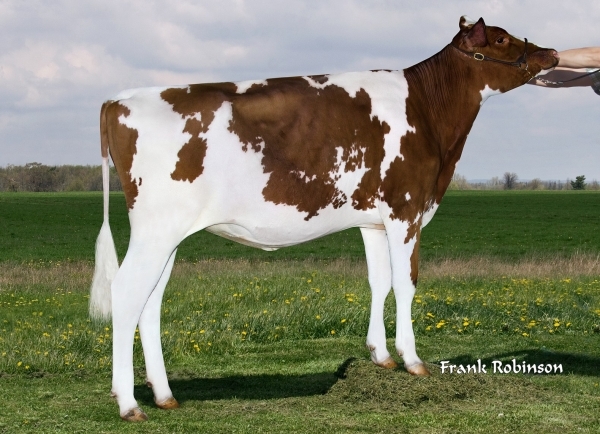 New acquisition at the Supreme Dairy Sale in St-Hyacinthe last November, she is granddaughter of the famous Sandy-Valley Melody, her name is MIMI and she is the #3 Distinction daughter in the world with a GTPI over 2500. Her dam is a Mogul who will be calving early 2015. Here are the results from our last classification done on September 10th 2014. A new RED Excellent at he farm, Sahara Aisha from the Apple Red family, her mother is the famous Baxter Aika ! 4 new VG, one 86 points : Mirakina Fever, Snowman Sea Queen, Fever Bombi and January Mitsonika. Also an Aftershock Bally, 87 points. 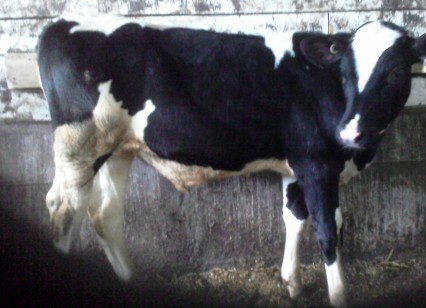 ALNA IOTA MISHKALY Fresh June 17th, 2014, 60 kg at 35 days !!! It’s pleasure to present our animal line up.